Grand Waikikian Suites by Hilton Grand Vacations offers a beautiful oceanfront paradise and a memorable romantic experience. This Waikiki hotel boasts six swimming pools including the Paradise Pool, a family activity pool with four slides, three waterfalls and two heated spas. Accommodations include one- or two-bedroom suites and spacious living and dining with a fully equipped kitchen and balcony. 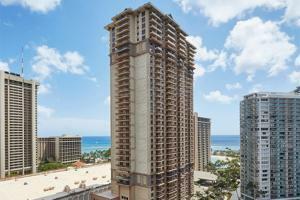 Located in Waikiki, just 8 miles away from Honolulu International Airport. Rainbow Lanai - casual dining, breakfast buffet; Tropics Bar & Grill. Ala Mona Beach Park, City Center, Diamond Head Crater, Dole Plantation, Pearl Harbor, Royal Hawaiian Shopping Center.